Say goodbye to your weight problems and lose weight effectively through a tested diet. This application is based on the 90 Day Diet and will organize the way you eat so you can achieve your long term weight goals. The main idea of the diet is the selective/separate eating, which means not mixing different kind of food (proteins, starches, carbohydrates and fruits). The 90 Day Diet managed to convince people that metabolism is very important part of our health and controlling the body weight. Improper metabolism is a major cause of weight loss or excessive weight gain. That’s why the goal of the app is to learn you how to establish a better metabolism with controlling what you eat. On of the main advantages of the 90 Day Diet is that it changes your metabolism in direction, where you can get rid of overweight and also you will be able to control your weight at desired level. The goal of the app is not only to help you lose weight, but also to improve your overall health. Thus, In addition, the 90 day Diet is extremely beneficial for people with high blood pressure. If you follow this diet you will find out that in fact its meals contain all the vitamins and minerals that your body needs. Accompanied by slight exercises, the 90 Day Diet can radically change you life for better. The 90 Day Diet mobile application is designed to assist you during the diet. Use it when planning a diet and creating or implementing a healthy eating plan. This is an effective and trustful diet plan to lose weight. 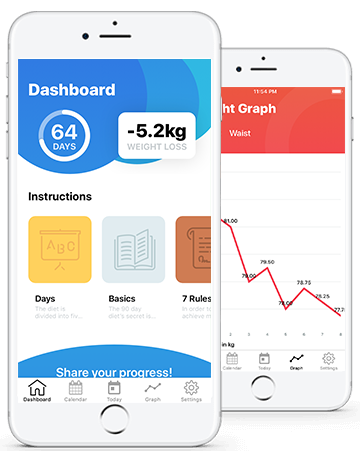 Along with the great tracking features like the diet tracker, weight tracker and the meal plan, you will get to your goals much faster. Ability to create a flexible schedule for the diet – start it today, start it in the future or if you have already started it you can pick up your start date without problems. Detailed information about every single day – what exactly you can eat and recommended sample meals. Statistics – how many days you’ve passed, how many kilograms you’ve been when you started the diet and how many you are now. See why 90 Day Diet app is mentioned as one of the best weight loss tips. Lose weight with planning a diet and implementing the features given in the 90 Day Plan app.